Hey there! Thanks for dropping by Horse Rescue - Diamonds In The Rough! Take a look around and grab the RSS feed to stay updated. See you around! Horse and Hound is having a tack / yard sale Saturday March 26. Proceeds benefit our Diamonds In The Rough and USERL. We look forward to seeing you there. Good bargains… come check it out. We just adopted out two mares, Phantom and Cali. They went to a farm in North Carolina with lots of pasture and horses to play with. Tomorrow, we welcome anyone who would like to volunteer with a horse rescue. We will begin at 2pm at Merry Oaks Farm. If you would like to join us and need directions, please email us at rescueahorse@hotmail.com. Phantom and Callie (need to adopt together) – mares, upper teens, western, trail horses. Phantom is a black & white paint, Callie is a tri color, and they are sisters. Tiny Tim – anglo arab gelding, born in 2007. He can be shy and he is just under 15 hands due to malnutrition. VERY SWEET:) And a fantastic boy in the saddle. Marley – black and white paint saddlebred gelding (1994). Needs groceries before we will ride him, but he is broken to ride and said to be amazing under saddle. Riddick – quarter horse (2002) and recently gelded in early January. Very calm for being a stallion so long. Also ridable. Chase and Austin have also been adopted by the Perry family. They will also remain at the farm until they can gain some more weight. We are hopeful and think they will be able to go to the Perry farm in April. We would also like to Thank the Perry Family for their hay donation. Diesel was also adopted out… I’m going to miss my “Denis the Menace”. He is going to a gentleman that has several years of experience with horses and he fell in love with Diesel, who wouldn’t though? This lovely little lady was brought to the farm yesterday. We also have six others who came too and they all need groceries. All of them seem very kind, but it is going to take us some time to put weight on them. This little mare is about 250 lbs. under weight. 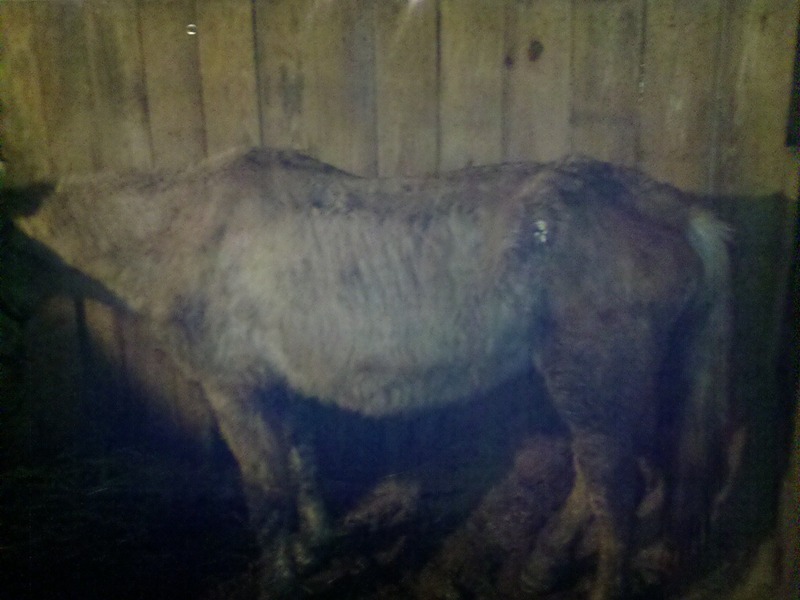 The farm they came from still has several more horses and animal control is handling the issues. We are just taking in the ones they allow us to have. We are told that the farm owner became overwhelmed with the number of horses she was trying to help. We don’t know the whole story, but we are glad to have them at the farm where we can make sure they are fed, vet checked, and sheltered. I will be at the farm in the morning and I look forward to seeing our amazing volunteers. These amazing volunteers worked so hard today to make sure we had cleaned out, freshly bedded stalls, fresh buckets of water, and yummy alfalfa hay. Two of our local tack shops, Sesroh’s and Horse & Hound also made donations to us for the rescues. Without everyone coming together, this would not be possible. You are all amazing! Please let us know if you are able to see the photos. I am only allowed a limited amount of picture space on this blog. I am going to try to add a link to an online photo album. Please let me know if this works for you all. We will be a work in progress for a while until we can work the kinks out. Please click the link http://cid-b89bf5cb00bd1eee.skydrive.live.com/redir.aspx?page=play&resid=B89BF5CB00BD1EEE!136 to view our companion horses.